Halflings can hide like nobody’s business. And these guys almost never miss a saving throw (regardless of category). Of these abilities, I think the saving throw to knock missiles out of the air is perhaps the most evocative. It is also a great use of saving throw mechanic, which I think is often (poorly) overloaded to perform actions that are more properly skills or abilities. 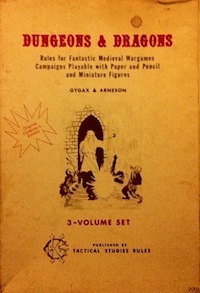 Also, if deflection requires an open hand, it also incentivizes unarmed fighting without resorting to unrealistic restrictions which can be problematic for suspension of disbelief (tangent: this is one of the reasons I love how Weird Fantasy Role-Playing has no armor or weapon restrictions while maintaining class distinctiveness). Martial artists are also supposed to be hard to hit in general, continually parrying, dodging, and blocking. Both of the old TSR classes represent this as decreasing natural AC. This is not horrible, as dexterity can do the same thing, but it does work against the traditional notion of AC as the class of armor worn. So what if we do away with the AC bonus, and instead give the monk a saving throw against being hit by any attack that they could reasonably dodge or block? Of course, they would only be able to use their saving throw if they were unarmored and have free movement. This, combined with the impressive halfling save progression, would lead to a very viable and interesting class. A good save is only a defensive and reactive ability though. And, in some sense, if you are being attacked directly when playing a class not designed for direct fighting, you are already in a bad place. So being hard to hit is all well and good, but to be really fun to play the class will have to have some proactive abilities as well. I also like the idea of being able to scale walls acrobatically (think how the characters in Crouching Tiger, Hidden Dragon kick their way up walls and roofs, particularly in the ninja chase scene). Maybe this ability is the inverse of being able to fall greater distances without taking damage. Perhaps something having to do with grappling and restraining would be another good ability candidate. B/X Blackrazor has a post about the class issues raised by halflings. The Nine and Thirty Kingdoms: The Monk: Thief or Fighter? It is interesting to me that people seemed to have connected the monk to just about every class other than halfling. This entry was posted in Uncategorized on September 25, 2011 by Necropraxis. Saw your comment on one of my posts linked above. Basing monks off halflings is an interesting idea, although of course it only works in games like B/X, LL, or LotFP, where hslflings are a class. Interesting take; almost more like a background, in the sense that it is connecting the character to some aspect of the campaign world (like joining a guild). To me, the monk class has always been more about the martial arts and unarmed combat aspect, and less about the religious dressing (and even less about the psionic parts, though that does also fit the archetype). I guess that would fit under your sub-fighter monk. More Bruce Lee, Jackie Chan, or Jet Li than Buddhist monastic.